To the cowboy, for whom the world was a circus of creation, nothing was beyond the scope of laughter. His fertile imagination could produce trail drives of dry-land terrapins, cowboy firing squads for fighting game roosters, and a breed of "honk-honk birds" that could outrun a horse. He used humor to express his fondness for the West, to exchange sarcasms with railroaders, to teach lessons to tenderfeet, and even—sometimes—to laugh at death. 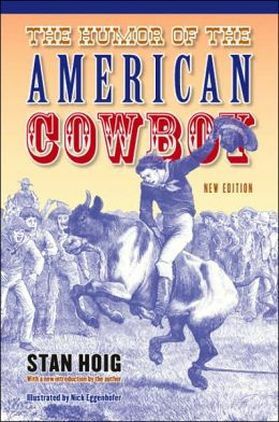 In The Humor of the American Cowboy, Stan Hoig presents an authentic collection of tall tales, anecdotes, yarns, jokes, and humorous incidents of the Old West that not only entertain but also focus attention on a sometimes overlooked phase of cowboy life. Paperback, c1958, 193 p : ill; 13 cm.